Graduate of the Professional Extramural Studies of TV Realisation at Polish National Film, Television and Theatre School in Lodz (PWSFTviT). 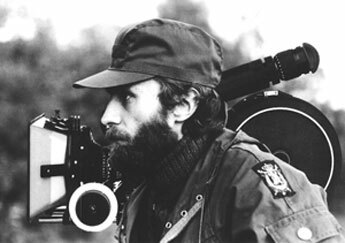 Between 1979-2010 he worked at the Educational Film Studio in Lodz (WFO/WFOiPE). As an assistant director and II director he collaborated with many esteemed directors of educational and documentary films, producing evidence of considerable self-dependence and creative share in film realization. He is especially interested in films concerning history, culture and art. Between 2012-2017 he worked at the Film Museum in Lodz. Author of a book entitled “Za kurtyną pamięci. Trójwyznaniowy Cmentarz Stary w Łodzi” (“Behind the Curtain of Memory. The Tri-Religion Old Cemetery in Łódź”) published by the Film Museum (2014). A member of the editing team of a book entitled “Jerzy Kawalerowicz. Malarz X Muzy” (Film Museum 2012) and „Bogdan Sölle. Zapiski scenografa” (Film Museum 2014). A co-editor of a book „Janusz Morgenstern. Musi zostać rysa” (Film Museum 2012), „Jerzy Wójcik. Sformowana energia” (Film Museum 2014), „Witold Sobociński. Wizualna ciągłość obrazu” (Film Museum 2015). A contributor to the „Film & TV Kamera” magazine. Between 1997-2002 an expert of the Film Production Agency (Agencja Produkcji Filmowej) of the Cinematography Committee (Komitet Kinematografii). A member of the Polish Filmmakers Association (Stowarzyszenie Filmowców Polskich), Union of Audiovisual Authors and Producers. Between 2012-2017 a member of the Board of the Film Museum in Lodz. Between 2007-2012 a Secretary of the Łódź Office of the Polish Filmmakers Association, since 2012 its Vice-President. 1986 - The Slav Down - from the cycle "History of the Polish Culture"
1987 - The Crown of the First Piasts - from the cycle "History of the Polish Culture"
1989 – Krzywousty and His Sons - from the cycle "History of the Polish Culture"
1990 - Kingdom Without a Crown - from the cycle "History of the Polish Culture"
1991 - The Jagiellons - Sigismund The Old - from the cycle "History of the Polish Culture"
1991 - The Jagiellons - Sigismund August - from the cycle "History of the Polish Culture"
1991 - The End of the Dynasty - from the cycle "History of the Polish Culture"
1993 - Between Golden and Silver Age - from the cycle "History of the Polish Culture"
1993 - Silver Age - from the cycle "History of the Polish Culture"
First Award at International Documentary Film Festival "Procinema Dokument 2009"